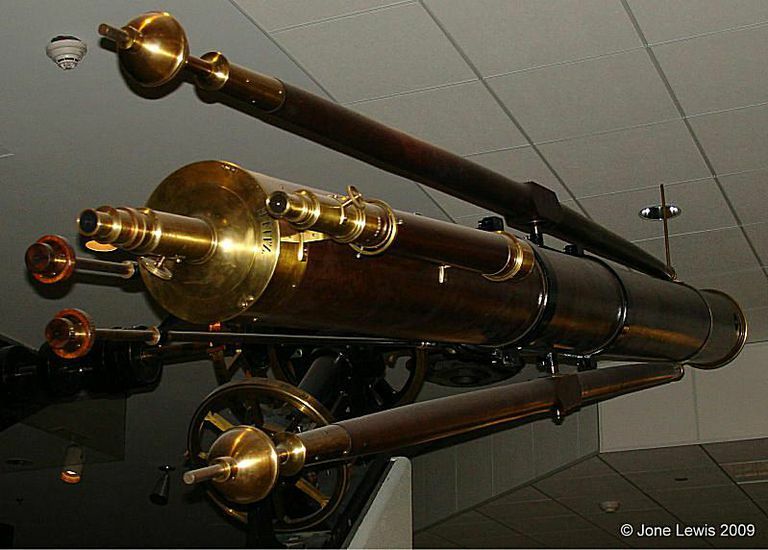 First Professional Woman Astronomer in the U.S. Taught by her astronomer father, Maria Mitchell (August 1, 1818 - June 28, 1889) was the first professional woman astronomer in the United States. She became a professor of astronomy at Vassar College (1865 - 1888). She was the first woman member of the American Academy of Arts and Sciences (1848), and was president of the American Association for the Advancement of Science. On October 1, 1847, she spotted a comet, for which she was given credit as the discoverer. She was also involved in the anti-slavery movement. She refused to wear cotton because of its connection with slavery in the South, a commitment she continued after the Civil War ended. She also supported women's rights efforts and traveled in Europe. Maria Mitchell's father, William Mitchell, was a banker and an astronomer. Her mother, Lydia Coleman Mitchell, was a librarian. She was born and raised on Nantucket Island. Maria Mitchell attended a small private school, denied, at that time, higher education because there were few opportunities for women. She studied mathematics and astronomy, the latter with her father. She learned to make precise astronomical calculations. She began her own school, which was unusual in that it accepted as students people of color. When the Atheneum opened on the island, she became a librarian, as her mother had been before her. She took advantage of her position to teach herself more mathematics and astronomy. She continued to assist her father in documenting the positions of stars. On October 1, 1847, she saw through a telescope a comet that had not been recorded before. She and her father recorded their observations and then contacted the Harvard College Observatory. For this discovery, she also won recognition for her work. She began to visit the Harvard College Observatory, and met many scientists there. She won a paying position for some months in Maine, the first woman in America to be employed in a scientific position. She continued her work at the Atheneum, which served not only as a library but also as a place welcoming visiting lecturers, until in 1857 she was offered a position to travel as the chaperon for a wealthy banker's daughter. The trip included a visit to the South where she observed the conditions of those who were enslaved. She was able to visit England, as well, including several observatories there. When the family that employed her returned home, she was able to remain for a few more months. Elizabeth Peabody and others arranged, on Mitchell's return to America, to present her with her own five-inch telescope. She moved with her father to Lynn, Massachusetts, when her mother died, and used the telescope there. When Vassar College was founded, she was already more than 50 years old. Her fame for her work led to being asked to take up a position teaching astronomy. She was able to use a 12-inch telescope at the Vassar observatory. She was popular with the students there, and used her position to bring in many guest speakers, including advocates for women's rights. She also published and lectured outside of the college, and promoted the work of other women in astronomy. She helped to form a precursor of the General Federation of Women's Club, and promoted higher education for women. In 1888, after twenty years at the college, she retired from Vassar. She returned to Lynn and continued to view the universe through a telescope there. Maria Mitchell: A Life in Journals and Letters. Henry Albers, editor. 2001. Gormley, Beatrice. Maria Mitchell - The Soul of an Astronomer. 1995. Ages 9-12. Hopkinson, Deborah. Maria's Comet. 1999. Ages 4-8. McPherson, Stephanie. Rooftop Astronomer. 1990. Ages 4-8. Melin, G. H. Maria Mitchell: Girl Astronomer. Ages: ?. Morgan, Helen L. Maria Mitchell, First Lady of American Astronomy. Oles, Carole. Night Watches: Inventions on the Life of Maria Mitchell. 1985. Wilkie, K. E. Maria Mitchell, Stargazer. Women of Science- Righting the Record. G. Kass-Simon, Patricia Farnes and Deborah Nash, editors. 1993.